I hope you have read the preceding article. 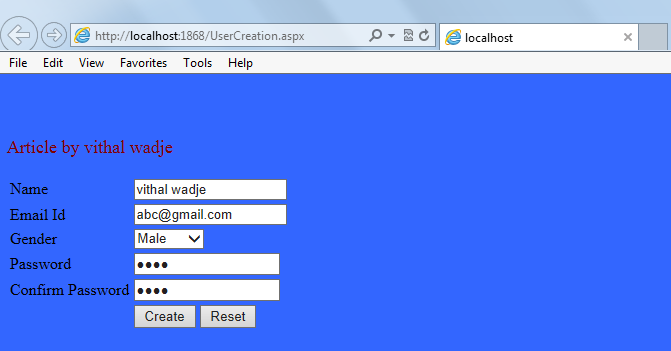 Let us now start from the creation of the function in jQuery. Creating the function in jQuery. The function is created in jQuery using the following syntax. In the preceding syntax, the function is the keyword provided by the jQuery to declare a function followed by a "$" (dollar) symbol and the "$('#btnSave').click" means that this function is called on the ASP.Net button click that has the id "btnSave". I hope you now understand the basics of validation in jQuery. 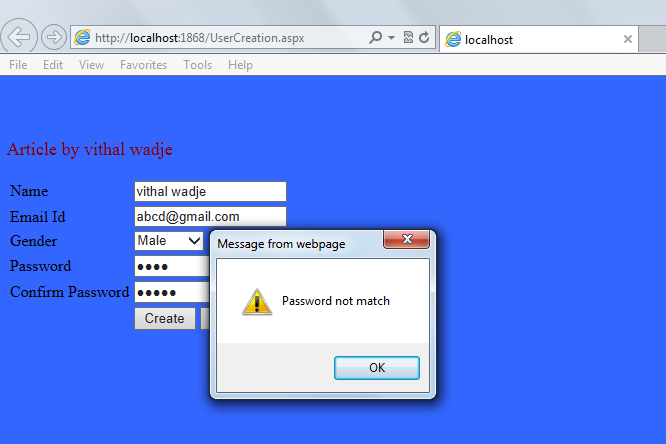 Let us now create the one sample web application that demonstrates how to do validation. "Start" - "All Programs" - "Microsoft Visual Studio 2010"
Then right-click on the solution in the Solution Explorer then select "Add New Item" - "Default.aspx page" (add two pages). We are adding two web pages because our requirement is, in the first web page there is form data to be filled in by the user and only after validating the form data, the form will be redirected to the next page. I hope you have created the same form for demonstration purposes as above. Right-click on Solution Explorer then select "Add New Item" then the in the "script.js" page rename the .js page as you wish, I have renamed it to "UserValidation.js". In the code above I have taken the ASP.Net control's values in variables so it cannot be repeated again and again in our function the emailExp variable holds the pattern of the email id in the form of a regular expression. In the preceding condition, to ensure that the form control's values are blank the message "Enter All Fields" is shown to the user and finally we are returning false; that is very important. It's very important to use the return false statement after the condition block that returns false so if validation determines that the business requirements are not met then the form cannot be submitted. If you do not return false then the message will be displayed to the user that all fields are required but the form will be posted back and it gives you the second page directly. 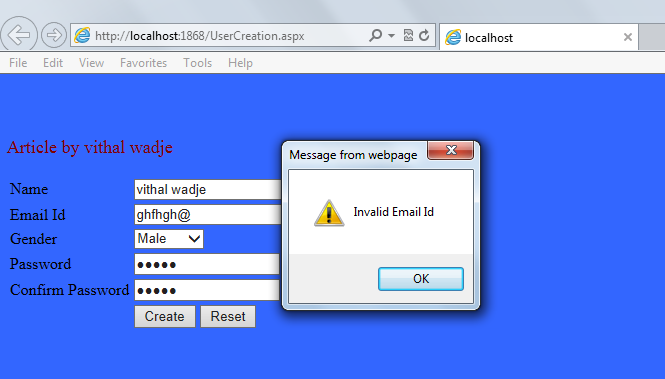 Therefore the return false statement works similar to the Required Field validator of ASP.Net. I hope you understand the concept. In the preceding condition, we are checking that the two texboxes have passwords, in other words the password and confirm password. In the preceding condition, first we ensure that the email id is not blank then we match the email id entered into the text box to the Regular Expression that is saved in the emailExp variable. In the following example, I have called the function on the button click event that I have specified by using the control Id. I hope you have understood it . 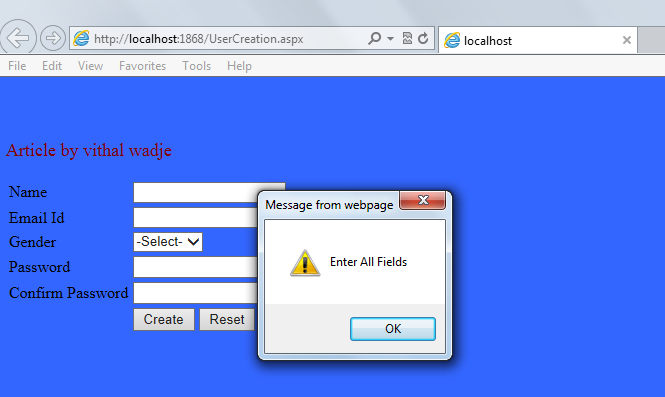 In the code above, only after validating the form data, the page is redirected to the "UserLanding.aspx" page. 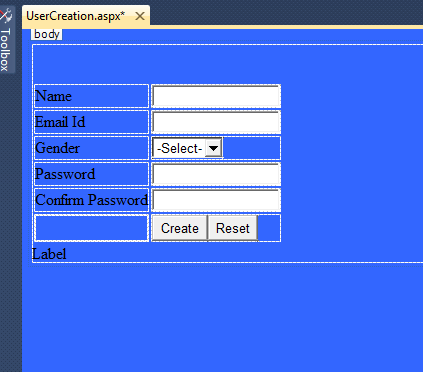 Now run the ASP.Net web application and click on the "Create" button without inserting any data in the form. It will then show the following alert message. In the preceding screen you clearly see that even I have written the code on the create button to redirect to the next page but it will not be redirected because the form data is blank and it does not satisfy our validation condition that we set. In other words, it's clear that the validation is done at the client-side in the browser level and only validates the data; it will execute the server-side code. Now enter the valid details.